The All Progressives Congress in Ekiti State has told Governor Ayodele Fayose to stop playing pranks to avoid the scrutiny of the Senate Committee on Local Governments in the disbursement of the bailout cash approved to the state by the Federal Government. The APC said the bailout was different from the regular federal allocation that could not be monitored by the allocating authority. It added that the governor could not hide under the Constitution to abuse a special intervention scheme that specifically insisted on a set of rules for strict application of the funds for the purpose for which it was approved. Fayose had sent a letter to the National Assembly, citing separation of power and independence of the state in the appropriation and application of federal funds allocated to the state governments. 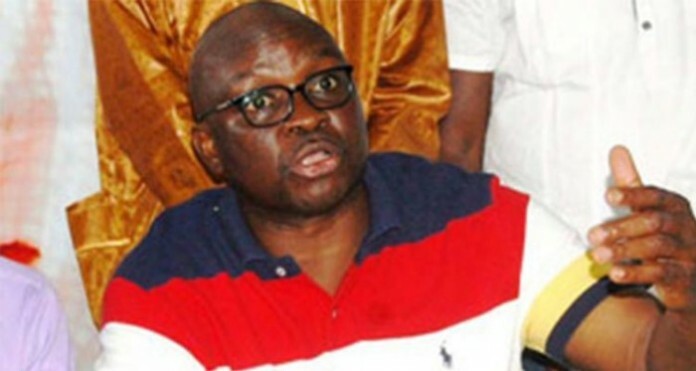 But the state APC Publicity Secretary, Taiwo Olatunbosun, said in a statement on Thursday that Fayose was playing with facts and the law to avoid scrutiny on how he spent the special funds specifically approved to pay backlog of salaries, pensions and other entitlements to former political office holders. He said the governor’s “recalcitrant action” was a confirmation of the party’s earlier allegation that he had misappropriated the fund. Olatunbosun said, “Fayose cannot pretend that he did not know that the Federal Government attached certain terms and conditions to the bailout before he collected it and we wonder why a governor that agreed to the terms is now refusing to explain how he spent the money to establish transparency in the application of such terms. “The bailout is like taking a bond that is programme-specific and Fayose knew this before he took the bailout and we wonder why he is now behaving as if the bailout is a Father Christmas gift that doesn’t require accountability. “He conceded that the House of Assembly had oversight functions over statutory allocations, explaining, however, that the bailout was a dedicated fund approved by the National Assembly for the Central Bank of Nigeria to disburse to states owing their workers. “Since the National Assembly has oversight functions on the CBN and other federal agencies, it follows, therefore, that it can monitor how the bailout is spent by asking questions. “In fact, one of the conditions attached to the disbursement of the bailout is that its disbursement by benefitting states shall be monitored by the CBN and this means the National Assembly can also monitor,” he explained.